DraftKings cofounders (from left) Jason Robins, Paul Liberman, and Matt Kalish say their company is not in the gambling business. The commercials for Boston-based DraftKings pitched a dream of winning big money and beautiful women by playing fantasy sports. But it wasn’t the bikini models in the commercials that enticed James Gardner, a 40-year-old custodian and father of four from Brockton. He responded to the lure of free money. That tantalizing offer in a DraftKings digital promotion, Gardner alleges, proved to be fraught with deception. Now he is pursuing a federal class-action, false-advertising lawsuit against DraftKings, which in fewer than four years has gone from a techie startup to a billion-dollar powerhouse. Its partners include many of the world’s largest sports entities, among them Major League Baseball, the National Hockey League, Fox Sports, ESPN, and the Red Sox, Patriots, Celtics, and Bruins. DraftKings, which faces similar class-action suits in Florida and Illinois, declined to comment on the marketing practices at issue, citing the litigation. But it denies a second accusation often leveled at the company — that it is essentially a gambling operation. As online daily fantasy sports games explode in popularity — an estimated 16 million players are expected to spend more than $4 billion this year competing — the industry finds itself at the vanguard of a movement to break the nation’s broad and longstanding prohibition against sports gambling. Thanks to a legislative exemption, daily fantasy games do not meet the federal legal definition of gambling. But some gambling specialists consider daily fantasy contests a form of gambling, and five states have banned residents from playing the online games for cash prizes. To play, contestants pay fees and create virtual teams from a sport’s actual rosters. They compete against other virtual teams, with the winners determined by the statistical performances of the actual players in that day’s games. DraftKings operates contests in baseball, basketball, football, soccer, golf, auto racing, and mixed martial arts. Contestants can compete for free or play for cash prizes, with entry fees ranging from 25 cents to more than $5,000. The company expects to pay out about $1.2 billion this year in prizes. The Kraft Group, which owns the Patriots, considers the business model so promising that it has invested four times in DraftKings since 2013. DraftKings takes about 10 percent of all contest pots, which this year are projected to total nearly $1.35 billion. Amid the bonanza, the National Basketball Association announced last year that it had bought an ownership stake in DraftKings’s chief rival, FanDuel. Two days later, NBA commissioner Adam Silver called for legalizing sports gambling. “Sports betting should be brought out of the underground and into the sunlight,’’ Silver wrote in The New York Times. Soon after, Major League Baseball commissioner Rob Manfred supported reconsidering the ban on sports betting, saying times have changed. The changes have included Major League Baseball buying an equity stake in DraftKings, though Manfred has indicated the line between daily fantasy sports and gambling is so fine that he has banned baseball players from getting involved in fantasy gaming. “We have made absolutely clear to our players and front office personnel that we do not believe DraftKings or any other daily fantasy [game] is an appropriate activity for them,” Manfred told reporters last month. The National Hockey League, while not endorsing sports betting, recently unveiled plans to become the first professional sport to locate a major league team in Las Vegas, the world capital of sports gambling and a hub of daily fantasy competition. Las Vegas last year hosted a fantasy sports contest in which FanDuel awarded $7 million in prizes in a single day. This month, DraftKings plans to pay out $4 million during a fantasy baseball championship on the Vegas strip. 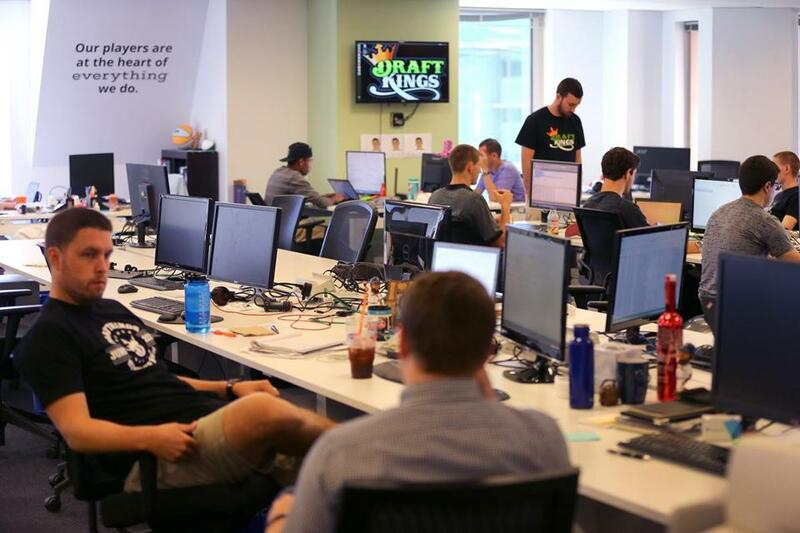 In Boston, DraftKings has become as ubiquitous as pigeons on the Common. The company spent about $60 million last year on marketing, most of it aimed at males 21 to 35 and much of it targeting Boston sports fans. 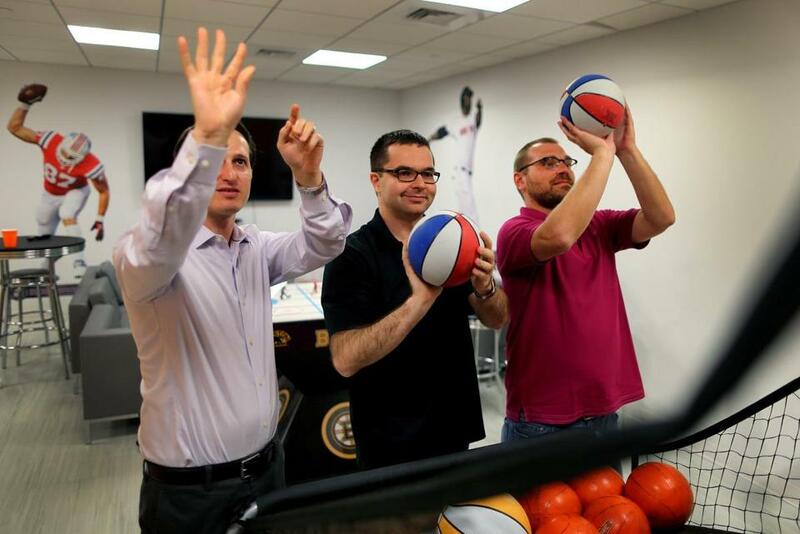 The fantasy industry has also attracted Boston sports stars seeking marketing deals. Patriots stars Tom Brady and Rob Gronkowski have signed sponsorship contracts with fantasy operators: Brady with DailyMVP, Gronkowski with DraftKings. Sports shows on Boston media outlets are inundated with DraftKings marketing, from traditional commercials to on-air personalities touting their daily fantasy teams. Sox game announcers regularly read DraftKings promotions claiming the company has paid out $34 million in prizes to Boston residents alone. 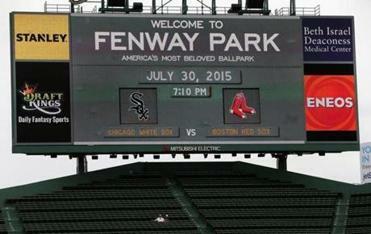 A DraftKings advertisement was featured on the Fenway Park scoreboard in late July. Fans who visit RedSox.com can click on a promotion giving them free entry into a DraftKings contest. The Sox have stepped up their commitment to attracting younger fans. “We take our lead from Major League Baseball, from which we have received clarity,” Kennedy said. Similarly, the Patriots struck a sponsorship deal with DraftKings after the NFL granted teams permission to partner with daily fantasy purveyors. The Patriots’ contract with DraftKings is separate from the Kraft Group’s investment in the company. When the Celtics play at TD Garden, DraftKings logos pop up on courtside signs, company advertising appears on the Jumbotron, and fans are given chances to win tickets to a luxury suite and visits with former star players. “Fantasy gaming is a rapidly growing market with highly engaged sports consumers, and DraftKings provides another way for our fans to follow and connect with the NBA and the Celtics on a second screen,” the team said in a statement. A Bruins spokesman said no one was available to discuss their relationship with DraftKings. DraftKings operates contests in baseball, basketball, football, soccer, golf, auto racing, and mixed martial arts. Contestants can compete for free or play for cash prizes. Meanwhile, with billions of dollars in play, state Senator Michael Rush of West Roxbury has filed a bill that would authorize the Massachusetts State Lottery to grab a piece of the action by launching a daily fantasy game. Rush’s plan calls for the lottery to sell prepaid fantasy sports “play cards,” with the first $125 million in revenue going to the state’s cities and towns. Michael Sweeney, the lottery’s interim executive director, said the agency is keenly aware of increasing competition in the gaming market and is prepared to evaluate the possibility of introducing “online games of skill” such as daily fantasy sports. Though federal law has long prohibited sports betting in virtually every state but Nevada, Internet goliaths such as DraftKings and FanDuel are free to operate online in all but five states — Arizona, Iowa, Louisiana, Montana, and Washington — because of the exemption in the 2006 federal Unlawful Internet Gaming Enforcement Act. The exception is based on the premise that fantasy sports are not gambling but games of skill rather than chance. Jason Robins, chief executive and cofounder of DraftKings, said in an interview that his company is not in the gambling business. He cited the federal exemption as well as internal company data that suggest succeeding at daily fantasy sports requires knowledge and skill, despite elements of chance such as weather and injuries. “The reality is that the best players do well and win consistently and get better over time,” Robins said. “For me, that’s the most compelling evidence” that online fantasy sports are games of skill rather than gambling. Daily fantasy players risk money on the outcome of individual athletic performances, much like sports bettors risk wagers on game results. “I don’t know how to run a football team, but I do know how to run a casino, and this is gambling,” Murren said. Treatment specialists say the line between gambling and fantasy gaming has so blurred that some customers have developed gambling problems by playing daily fantasy sports. Keith Whyte, executive director of the National Council on Problem Gambling, estimated that only “a fairly slight” percentage of daily fantasy players experience gambling problems. But he called on daily fantasy operators to establish better consumer protection practices aimed at minimizing the risks for compulsive gamblers. Even the president of the Fantasy Sports Trade Association has expressed reservations about daily fantasy operators aggressively selling their contests as get-rich-quick games. Daily fantasy contests are derived from season-long fantasy games that have thrived since the 1980s among friends who play for fun and relatively small amounts of cash. In Gardner’s case, he alleges he made a $10 deposit in a DraftKings account, believing he would receive what the company promoted as “a 100% first-time deposit bonus.” The company’s television commercial also promised new customers they could double their deposits by signing up with DraftKings. Only later, Gardner alleges, did he learn that deep in the fine print that took several clicks to discover on the DraftKings website were conditions involving “frequent player points’’ and a requirement that customers either win contests or deposit additional money within four months for a chance to receive the full bonus. The suit claims Gardner would have needed to spend an additional $240 within four months to achieve his $10 bonus. DraftKings contestants who made initial deposits of $600 would have needed to spend an additional $14,400 within four months to double their initial deposits, the lawsuit alleges. Gardner’s lawyer, Ken DeMoura, confirmed details of the allegations but declined to publicly comment on the case. He said Gardner also would withhold comment. The suit states that at least 100 DraftKings customers will allege they were deceived by the company’s “free bonus” promotions. A DraftKings spokeswoman declined to say whether the company has changed any promotional practices since the lawsuits were filed this year. FanDuel has responded in similar fashion to a federal class-action, false-advertising lawsuit in California. Carchian, the trade group president, declined to address the false-advertising claims. But he left little doubt about the enormity of the stakes. He said interest is so hot in daily fantasy sports that the industry has attracted millions of new customers in the last year, as DraftKings and FanDuel vie for supremacy. Between them, the rivals control more than 90 percent of the market, with FanDuel claiming about 60 percent and DraftKings more than 30 percent. Yet both will be challenged by Yahoo, which has spent more than 15 years building a large base of season-long fantasy players and recently began offering daily contests for cash. 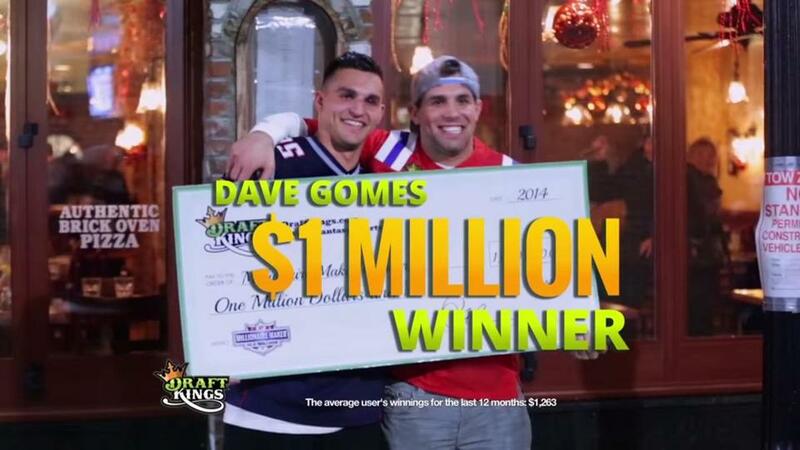 DraftKings, meanwhile, continues to wage a massive marketing blitz. The company has widened its scope by forming partnerships with entities such as World Wrestling Entertainment, the World Series of Poker, and the Belmont Stakes. The Belmont sponsorship proved particularly fortuitous as three DraftKings logos appeared on the covers of newspapers and magazines around the world in photographs of American Pharoah crossing the finish line to become horse racing’s first Triple Crown winner in 37 years. Robins predicted the best is yet to come for his company. By then, the courts and the company might have determined the future roles of free-cash offers and fictional bikini models. Shira Springer and Peter Abraham of the Globe staff contributed to this report. Bob Hohler can be reached at robert.hohler@globe.com.